Your backyard is a pretty marvelous place. It allows you to grow beautiful flowers and produce that tastes so much better than what you can find in the grocery store. That’s pretty awesome, but there are some things that can make your backyard seem like an issue. You may go outside one day to find that your spinach is holey or your tomatoes have been nibbled on. 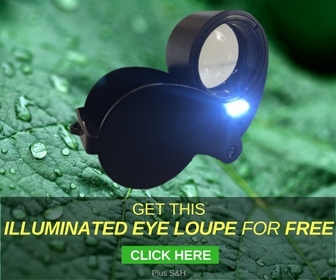 The culprits in these circumstances are usually insect pests. Slugs and other bugs can be making a meal of your spinach and tomato hornworms may be destroying your hopes of a bumper crop among other pests that can be just as dastardly. It’s enough to make an organic gardener think about going the nuclear route by turning to conventional, highly toxic, synthetic chemical pesticides to eliminate the problem. 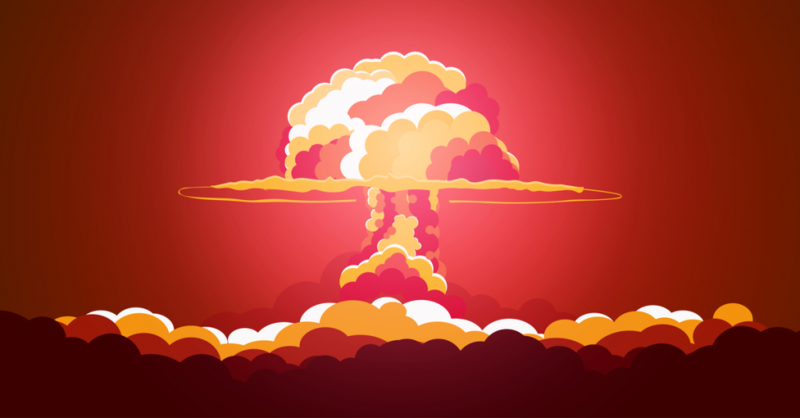 It can certainly be tempting to take the nuclear option. Just one spray here or there to get rid of the pests, and then, you’re back to only using organic methods in the garden. That shouldn’t do too much harm, right? The truth is that there are a few problems with this theory. You probably won’t get rid of your problems with just one spray here or there. You may find that while you got rid of a few here or there, more pop up in other areas. You may end up with secondary pest outbreaks. This means that while you’ve killed off the original pest that has bothered your yard, you’ve also killed off any defender bugs that were keeping other pests out. This means that you’ve opened up your garden to all different types of pests coming in to cause issues. Will you reach for the pesticide again to create a never-ending cycle? Another problem with using synthetic chemical pesticides even just once is that you may be contributing to pesticide resistance in the insects in your garden. More and more pests are starting to show signs that they are able to survive being dosed with some pesticides. For instance, one research study found that some fruit flies that were exposed to DDT, a banned pesticide, were able to use the DDT as a food source because they could metabolize it. Then, there is the worry over the health and wellness of your garden, your garden’s soil, and your family that will eat the produce that comes out of your garden. 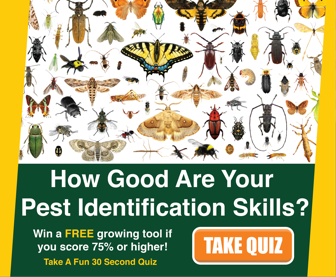 Is using the “easy” way to deal with a pest problem worth the worry of using a toxic chemical pesticide just a few times? The good news is that you don’t have to go nuclear on your backyard pests. 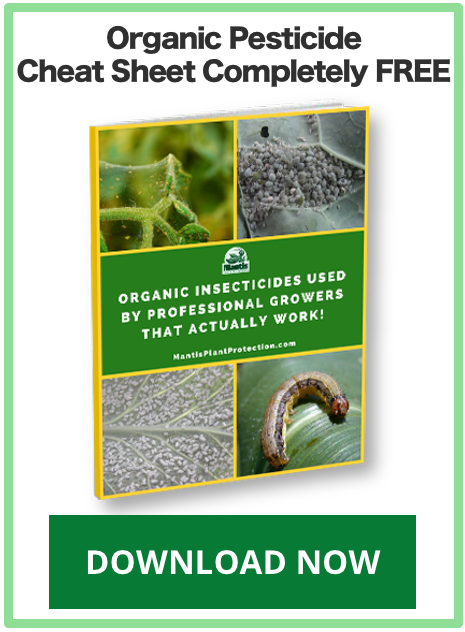 By going down the path of using synthetic chemical pesticides on your garden means that you are introducing these chemicals into the soil and are potentially killing off all of the insects that you actually want in your garden. Your pollinators that help you have a bumper crop and are already endangered in many areas can pay the price. Your earthworms that help aerate the soil and add nutrients may die off or move to your neighbor’s yards to avoid the contaminated soil. The best way to avoid the nuclear option of chemical pesticides is to fight fire with fire. 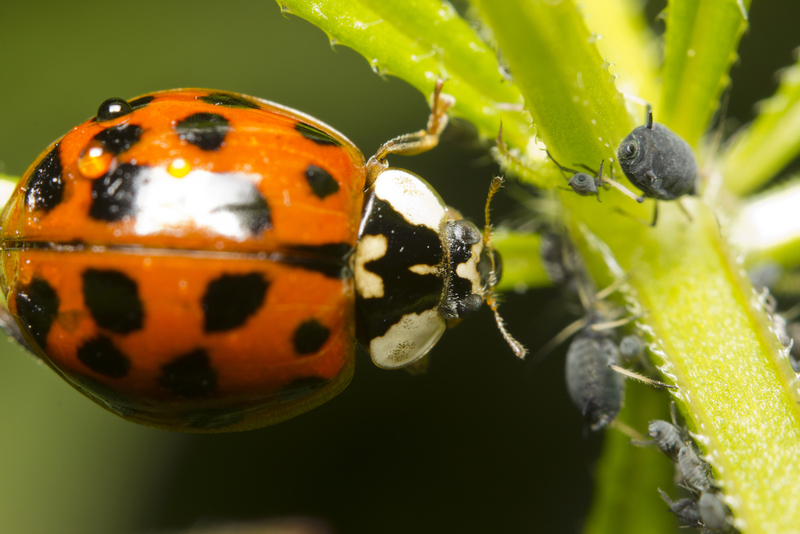 Make your garden more enticing to beneficial insects that will help eradicate these pests. 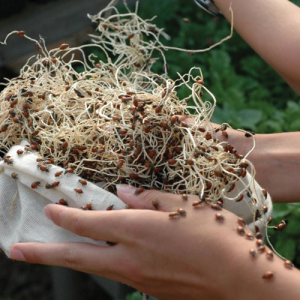 You can even introduce beneficial insects to your yard to eliminate the problem pests that are targeting your crops. Both of these options are a good way to battle bugs without resorting to chemical warfare. 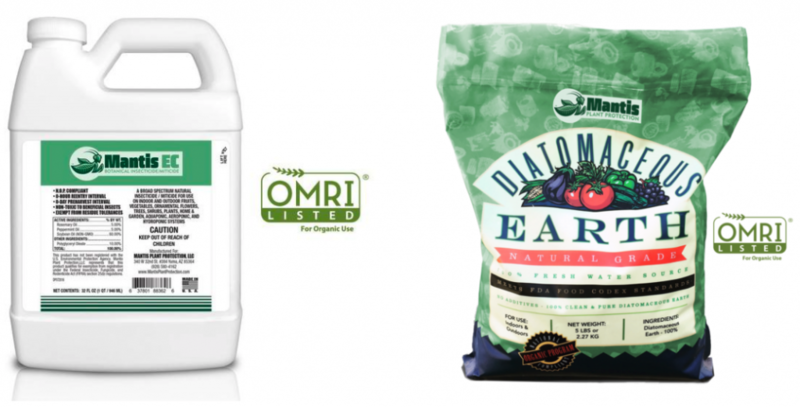 When you do have to treat for insect pests, your best option is to use certified organic, natural insecticides that don’t employ toxic modes of action and will have minimal impact on beneficial insects and the environment. 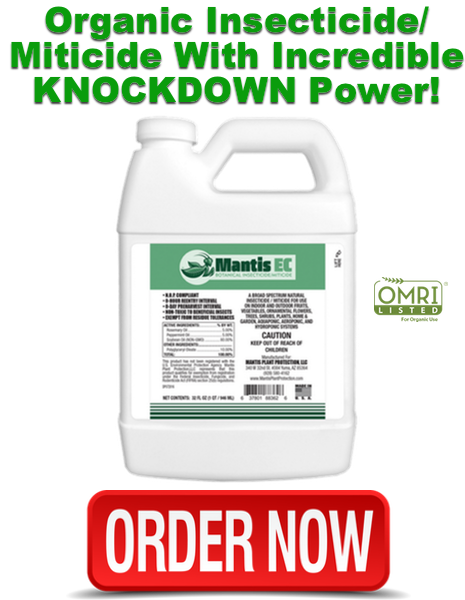 And that’s what we, Mantis Plant Protection specialize in… CLICK HERE to see our certified organic pesticides that kill the bad insects without destroying populations of the good ones. The first thing that you need to do to bring in natural pest predators to your backyard is to not use any chemical pesticides, and if you use any organic methods, such as neem oil and other non-toxic organic insecticides, you use it carefully to not disrupt your beneficial insects. The next thing that you should do is to plant flowers and herbs that are attractive to the beneficial insects you want in your yard. You can find flowers and plants that bloom in the different seasons to keep your garden covered. 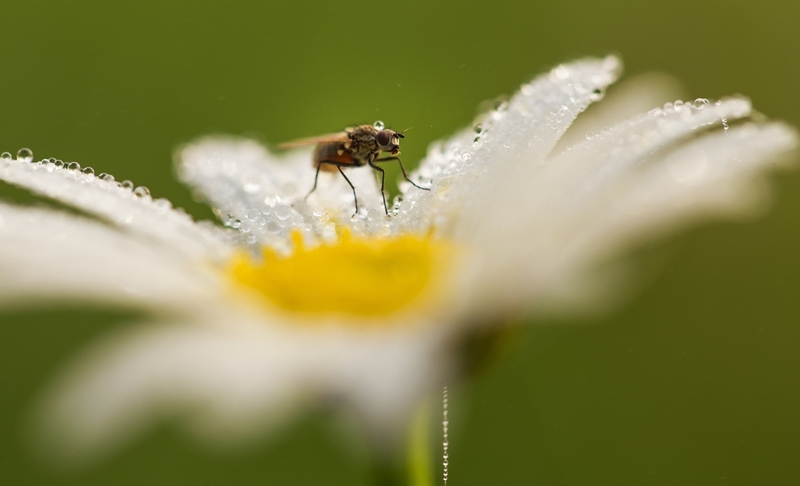 Many of the beneficial insects prefer smaller flowers with petals that are short to make it easier to reach the nectar than big flowers with tons of petals that make it harder to get to the good stuff. This is because their vegetarian stage before or after they become predators they need to be able to get to the nectar to eat. Since you want these insects in your yard in all stages of their life cycle, you want to ensure that they have adequate food at all stages. 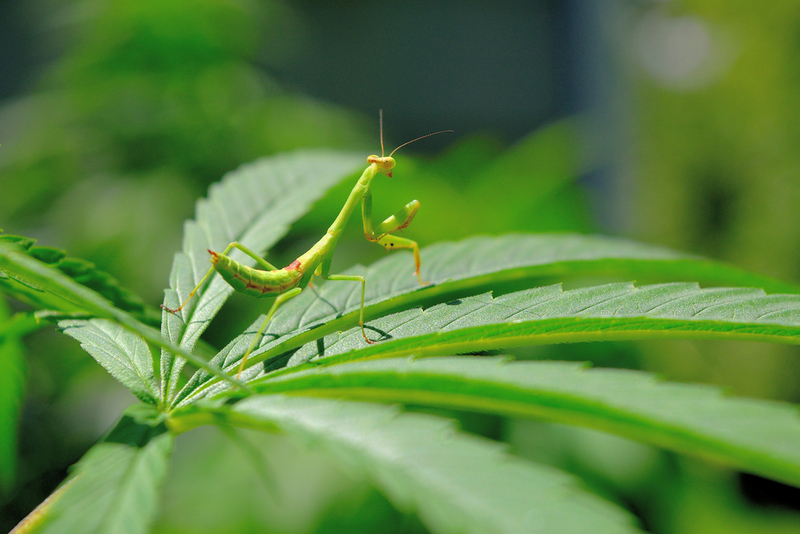 We couldn’t have a list of beneficial insects without having the inspiration for our company, praying mantis, at the top! 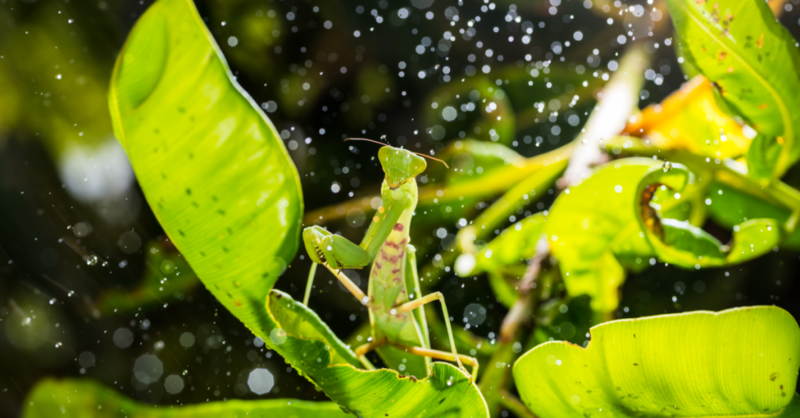 Mantis are the most charismatic insects ever and they’re also great insect predators devouring crickets, grasshoppers, house flies, and many other insect pests. 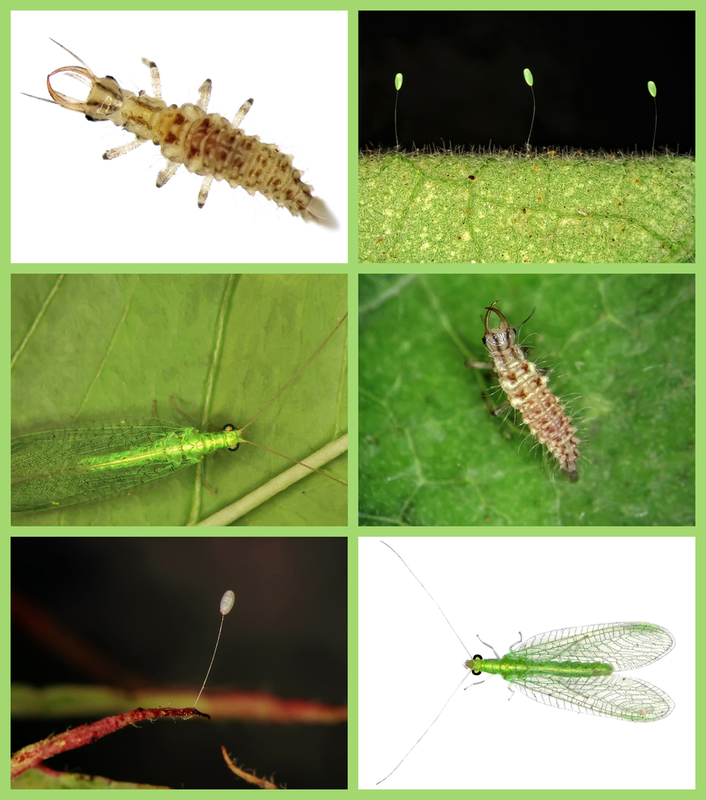 Lacewing larvae are predators that you want in your garden. They feed on moth eggs, small caterpillars, aphids, scales, thrips, and mites. The adults are brown or pale green with wings that are rather distinctive as they look like lace because of the veins. Your friend the ladybug is more than just a friend. It’s a voracious predator as larvae and as an adult. They eat aphids and soft-body insects. Planting nectar and pollen rich plants is vital to keeping them in your garden as they need to feed before they can make more ladybugs for your garden. 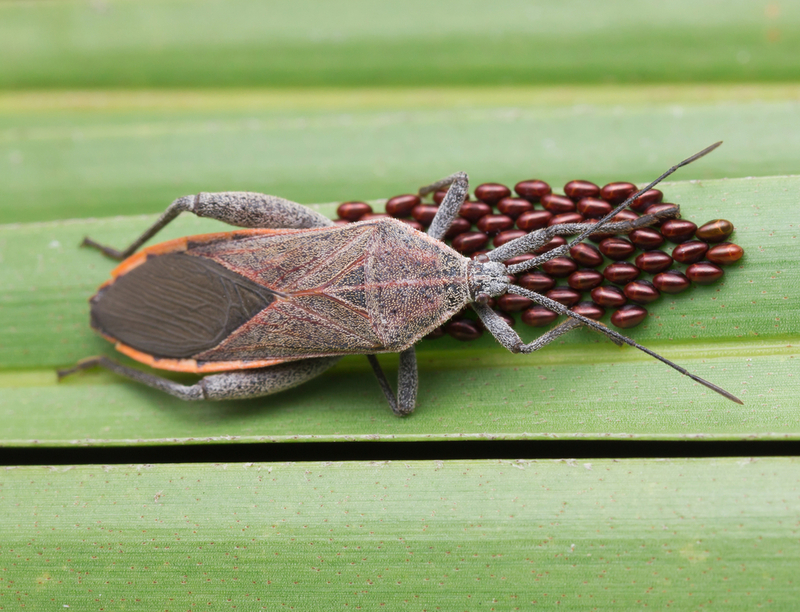 Some of the bugs that you may be guilty of squishing in your yard could be your savior. 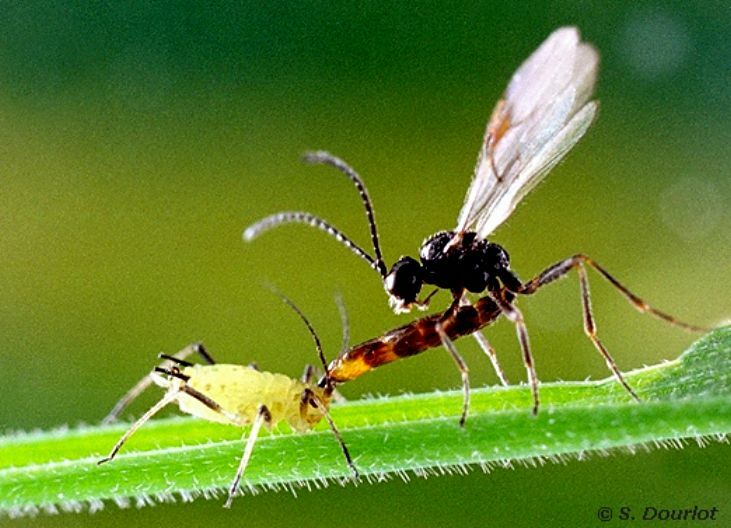 Assassin bugs, soldier bugs, ambush bugs, and pirate bugs are all enemies of your enemies. They eat leafhopper nymphs, tomato hornworms, spider mites, thrips, small caterpillars, and many eggs of a variety of insects. There is even a lure made that will attract soldier bugs to your garden. At first glance, you may be like there’s no way that you want wasps in your yard, but these are the hunting and parasitic wasps that can really clean up your backyard. For instance, there is one small parasitic wasp that will lay their eggs on tomato hornworms, and when the eggs hatch, they use the hornworm as their food source. It sounds horrible, and when you come across a hornworm with funny bubbles attached to its back, it’s a bit gross, but this is nature’s way. When it comes to species of these types of wasps, there are hundreds of them, and many are very tiny. Attract them to your garden with your nectar and pollen giving plants. Tachinid flies look rather similar to the pesky flies that come into your home, but these flies are ones you want around your garden. They are enemies to sowbugs, sawflies, gypsy moths, Japanese beetles, tent caterpillars, squash bugs, cutworms, cabbage loopers, and armyworms. Hover flies look like little bees as they have a striped abdomen, and their larvae look like little slugs with heads that are pointed, but they are great for getting rid of aphids in tight places. The larvae can get into places to eat these aphids where other predator insects cannot, and the adults are a great pollinator. Plus, they are active in the early spring months when some of the other bugs are just getting started in their predatory ways. Spiders are another pest that many people hate to have around, but they are awesome for pest control as they will eat just about any pest. This doesn’t mean that you have to invite them into your home, but you’ll want to leave them be outside in your garden. 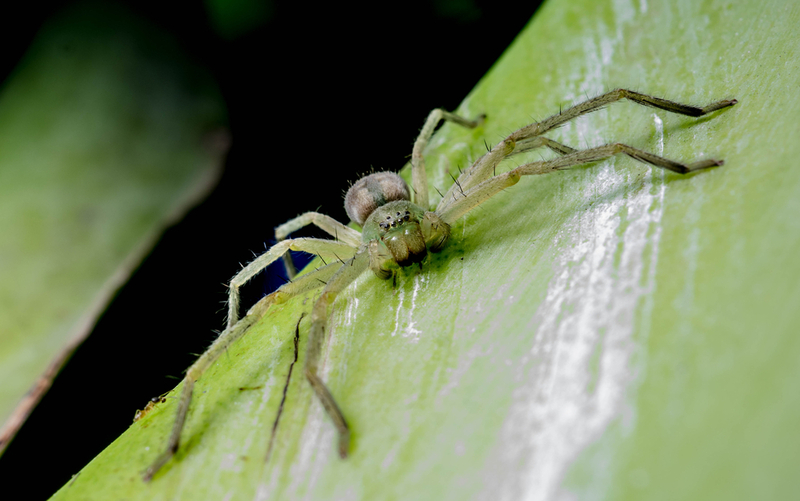 Your plantings and straw mulch are both good hiding areas for spiders. You may find that no matter what you plant, you’re having a hard time attracting the bugs that you want to your yard. There are several places where you can purchase predatory bugs to release into your yard. 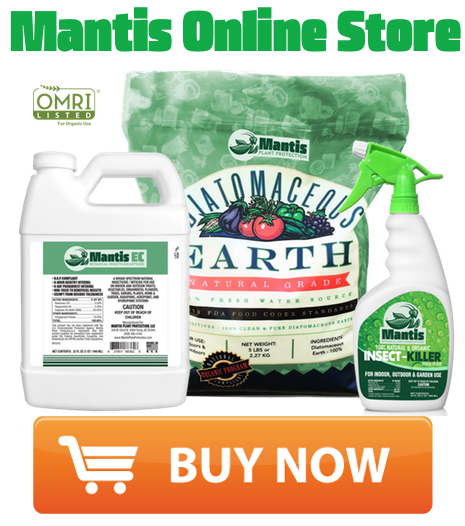 You can purchase things like nematodes, ladybugs, green lacewings, and more to let loose in your backyard to fight your battle for you.